Mattern Family: No More Dryer Sheets OR Fabric Softener. No More Dryer Sheets OR Fabric Softener. When I began running low on liquid fabric softener, I grabbed a bowl, an old hand towel and began an experiment. It worked so well that I felt compelled to share it with all of you. By the way... since using this towel, I have said good-bye to dryer sheets AND fabric softener. Hang it over a chair (or outside on a clothes line) to dry. My house smelled super clean for the three days while this towel was drying completely. Yes, it took three days! You must make sure it dries completely! After the towel dries you just throw it in your dryer along with clothes and use it as a dryer sheet for 40-50 loads before soaking again. My clothes are softer then they have ever been when I used fabric softener. Hi Hon...it's been a while! I took the Summer off...tryin to play catch up on my favorite blogs! (Prolly will take me all Winter long to do that!) I luv this idea & am going to give it a try! Hope you & your family are doing great! I'm totally trying this! How neat is this! Just stumbled upon your blog from a friends. Looking forward to reading more from you. Wow! What a great way to save money and the environment. Less fabric softener used! Yay!! Thanks for sharing. I'm on Pintrest but never really caught on to it. Maybe this is inspirations enough for me to check it out again. I thought it was just pictures and got bored. So glad you stumbled here. Which friend lead you to me. Would love to thank her. Now I'm off to check out your blog. LOVE your site name by the way! So many great idea's on Pinterest! Let me know if you try this, and what you think! That is such a cool idea! Thanks for sharing! I love any way to save money! I saw this on Pinterest too and wondered if it really worked. Thanks for sharing! I try to make my own detergent most months but I just can't give up the nice smell of fabric softners! You mentioned dryer sheets, but I didn't see anything about whether or not this controls static cling? I'm assuming so, but would love to know for sure. Thanks! Have you tried this with homemade fabric softener? Thanks! This is a "why didn't I think of that" PIN! Glad that you did! make your own fabric softner...its way cheaper and works great..i get essential oils and add to both the soap and softner so they match and smell WONDERFUL..pennies to make! What's the point? It's still adding toxins to your clothing that then sit against your skin all day. Shaklee makes a great fabric softener that would work wonderfully without all those nasty toxins. We also have biodegradable dryer sheets! Is there a Shaklee Webb site? Do they still sell vitamins? You didn't say goodbye to fabric softener... you just use it differently. I heard about this "new" idea when I was 13 yrs old away at camp and we had to wash our own laundry. And you should use as thin a cloth as you can find or you're really piling the chemicals into your clothing. Jay cloths work best. How long are do you soak the towel in the softner for? Also one of the comments below asked if you need a new towel each time, Do you? I did try this and so far am happy I did. It works great but have only done 3 loads of laundry so far..hope it lasts as long as yours did. My house really does smell nice! Wow, great idea. I liked especially the part that you can hang that cloth and use it as air re-freshener. I am going to try it for sure! Heather, I see there's a few people that have asked about if it really lasts that long that have had issues with it stinking up their clothes and also where people have asked about having to get a new towel each time. Can you tell me about that? I was thinking of giving these as Christmas gifts (trying to plan ahead, lol!) and I just want to know if it works before I invest a bunch of $$$ in supplies, ya know? Thanks yof ryour help! I loved the way it made my house smell!! I found that mine started to lose the bulk of the smell after about a month. Hope yours lasts just as long! I'm sure the brand of softener and such play a roll. Mine lasted about a month and then I would wash the same rag and start over. I never noticed my clothes smelling bad, just less of the yummy scent. I'm wondering if the brand of softener plays a roll? What a great idea Christina! I'd love your recipe! If I ever use essential oils the smell doesn't remain by the time it is dry? It seems very clean but no smell. I also make my own detergent but LOVE the smell of a fabric softener. Does the towel leave lint on the dark clothes? Or you can just put vinegar into the final rinse, save all the toxins that are inthe fabric softener that contaminates the planet and clogs up the dryer workings. I'm going to give this a try. I've been using vinegar and it works wonderful, but I miss the fabric softener smell. Thanks! What size towel did you use? I have to try this!! I see you used a hand towel..Thanks!! I use plain white vinegar. Pour into your fabric softener dispenser spot on your machine. Cheap. Fresh. No, your laundry does not smell like vinegar. And it also gives a real nice cleaning to your washer. Fabric softener is nothing more than liquid wax or wax coated sheets~ very heavy in bad chemicals, expensive and can cause skin irritations. Vinegar is pure and non toxic and much easier to use. 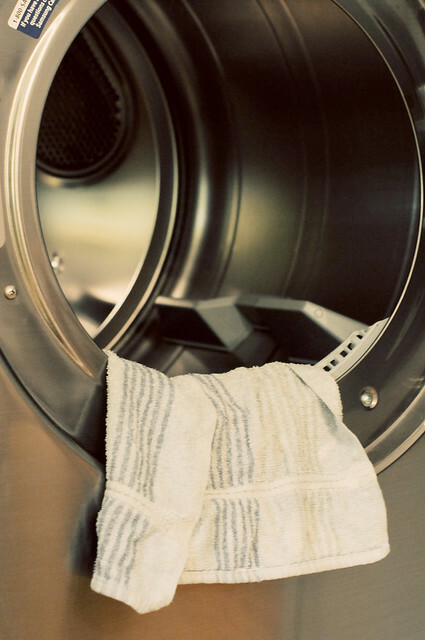 Is it true that laundry must soak in the softener for eight hours? in fact enjoyed account your blog posts. Anyway I'll be subscribing in your augment and even I success you get entry to consistently quickly. being the most dangerous way to get rid of the extra pounds. If you love fast-food and microwaveable meals for instance, then it's time to sit down and re-consider. I tried it it worked soooooooooooooo much better than any dryer sheet i've ever purchased! thank you thank you thank you!!! And it's so much cheaper. You saved me a ton of money cuz I love dryer sheets and i was getting ready to go buy a bunch but i had a bunch of bottles of liquid and i never use liquid so this worked out for me amazingly. My huge comforter now is softer than any dryer sheet i've ever used, and room smells of sheets too. Love this tip! Thanks for sharing! Featured it on my pinterest journey today ... I did link back to you. Thanks again! Look forward to reading more of your blog. Gonna try this . Thanks. I've gotten alot of secerts from pinterst. Love it. And thanks again for shareing. Haven't heard this one. should i mix the softener with water or just use straight fabric softener? moi, j'utilise du vinaigre blanc dans le distributeur à assouplisseur de ma laveuse à linge. Je paie un gallon de vinaigre $1.79 et je met 1/4 tasse dans le distributeur à assouplisseur de ma laveuse à linge. ÇA ME COÛTE PRESQUE RIEN. Works awesome! I love this method! I have learned something though, this works better and lasts much longer with COTTON washcloths rather than MICROFIBER cloths. I had some leftover dusting cloths that i didnt really use so i put them to the test. For some reason after the first use with microfiber, it was almost all used up. Cotton one didn't do that at all and lasted much longer. At least 20 loads, microfiber about 5 loads before I had to dip them again. Wouldn't this still coat your towels like FS does? Do you really want fabric softener sitting on your skin all day? This sounds like an awful idea. Ha ha ha ha lol. My thoughts too. You nailed it. buy products at wholesale prices from our huge inventory Microfiber Rags. Why do people leave comments in a language other than what the site is written in?!?! Building traffic elsewhere. Same reason people post lists of random words. Sometimes it's best not to have your say... makes you look clueless.